Jarrow Roofing striker Paul Chow during his time at Whitley Bay. Whitley Bay legend Paul Chow is in line for an emotional return to the club’s Hillheads Park ground on Saturday. With the weekend’s scheduled opponents, Dunston UTS, still being involved in this season’s FA Vase, a trophy Chow helped win for the Seahorses three times, Bay will now be playing their former striker’s current club, Jarrow Roofing, at home on Saturday, weather permitting. The Dunston game has been rearranged for Tuesday, April 19. Saturday’s game, if it goes ahead, will see Chow making his first return to Hillheads since moving back to his home-town club last February, having written his name into the history books with an incredible 270 goals during an eight-year stay in North Tyneside. While a warm welcome for the 35-year-old is assured off the pitch, there will be no time for sentiment when the game gets under way, with both clubs needing points to get their seasons back on track after lengthy lay-offs. The Jarrovians currently sit two points and two places above Whitley in the Ebac Northern League’s division one, standing 17th with 20 points, but Bay have three games in hand. Jarrow Roofing were the side Chow left in 2007 to move to Hillheads, having scored more than 100 goals for the South Tynesiders during two spells there. In close to eight seasons, he made 404 appearances for Whitley and his tally of 270 goals is just 37 short of the record of Billy Wright, the club’s all-time leading scorer. Alongside former team-mate Lee Kerr, he is the only Bay player to have scored in three consecutive winning cup finals at Wembley – in 2009, 2010 and 2011 – and he was also the first player to score in every round of an FA Vase-winning season. 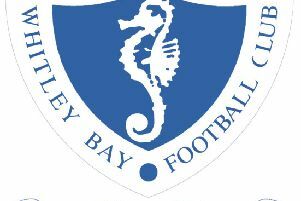 It was the same old story for Whitley Bay as it was for non-league football teams across the region on Saturday as virtually the entire programme of fixtures was washed out by the weather, including the Seahorses’ scheduled trip to West Auckland. Pitches remain waterlogged after the record-breaking month of wet weather, with club ground staff unable to set foot on the playing surfaces for fear of causing long-term damage. Whitley Bay’s list of postponements during this soggy winter has now reached double figures, and they face playing at least two games a week for the remainder of the season even if conditions improve dramatically in the coming days. The club have a minimum of 30 games to play before the end of April, a total that would be increased if they progress further in two cup competitions. Last Saturday’s game at West Auckland was called off on Friday, with the County Durham side’s pitch being deemed unplayable, and prospects for tomorrow evening’s fixture at Guisborough Town do not look good. On Tuesday next week, Whitley are due to play their twice-postponed Techflow Group Northumberland Senior Cup quarter-final against Morpeth Town at Hillheads Park, kicking off 7.30pm. Last weekend’s postponed game away to West Auckland will now be played on Tuesday, March 22.